Liz Nugent’s debut novel, UNRAVELING OLIVER, was originally published in the UK and Ireland in 2014 but made a second splash on this side of the Atlantic in 2017, when it was named a BookExpo Buzz book, among other acclaims. Nugent’s new American fans are lucky; she was already a bestselling author in her native Dublin when UNRAVELING OLIVER released, and now Scout Press is able to publish her other books on an accelerated schedule. Up next is LYING IN WAIT, a multilayered novel about a dysfunctional relationship between a mother and son --- and the dark secret they share. The identities of the murderers at the heart of LYING IN WAIT are never in doubt. In the opening pages, readers see Judge Andrew Fitzsimmons and his wife, Lydia, killing a young woman, Annie Doyle. Annie seems to have been blackmailing the judge somehow. But how and why? And why would this successful couple, with their beautiful home and picture-perfect family, even have any reason to associate with a “lying tramp” like Annie? 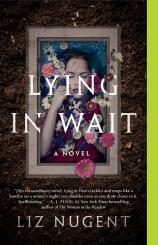 "LYING IN WAIT is one of those novels that keeps readers in a permanent state of imbalance. Just when you think you have things figured out, Nugent throws everything off-kilter again." Those motivations soon become clear, but it’s also clear that Lydia, at least, believes Annie’s death to be a nearly perfect crime, even after Andrew has buried the body behind Avalon, their manor home. Surely no one would suspect them --- and there were no witnesses. Soon, however, it becomes apparent that someone else has (literally) uncovered the secret, even if he is initially too alarmed to confront them --- the couple’s teenage son, Laurence. Over the following months, the relationship between Laurence and Lydia becomes more and more disturbing, as a narrative that rotates between them, between past and present, reveals their motivations and the secrets they try to keep from one another. Also adding her voice to the narrative is Annie’s surviving sister, Karen, a beautiful young woman who at first wants only to believe that her damaged, vulnerable sister is still alive somewhere, but eventually embarks on her own relationship with Laurence, one that will complicate everything. LYING IN WAIT is one of those novels that keeps readers in a permanent state of imbalance. Just when you think you have things figured out, Nugent throws everything off-kilter again. All of the primary characters --- including the dead woman, Annie --- are complicated and well-rounded, with personal and family histories that result in messy, realistically flawed motivations and defy easy categorization as “villain” or “hero.” Readers who first encountered Nugent’s work only recently will be thrilled with this new-to-us thriller --- and will be thronging for even more of her excellent work to make its way across the pond.